Jean-Claude Juncker has vowed that no matter how bad terrorism or the migrant crisis gets, the European Union (EU) will never give up on open borders. The European Commission president said terrorism could be countered with better intelligence-sharing between member states. On France 2’s Four Truths programme this morning, Mr. Juncker said “a lot of initiatives” will be required to strengthen security in the EU. After a bloody month for Europe in which the continent has seen multiple Islamic terror attacks — four in the last week in Germany alone — the EU president insisted better communication between member states would solve the problem. Mr. Juncker told presenter Gilles Bornstein that he “expected a better response from member states regarding the exchange of information between police and intelligence services”. The EU chief said he believes member states “are not yet used to the obvious need there is to better share information”. 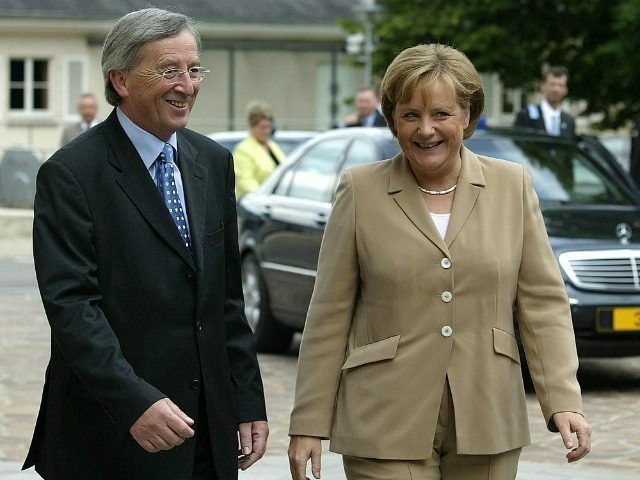 Mr. Juncker insisted that however bad the “migrant crisis” and terrorism in Europe gets, the EU will never call into question the free movement of people within the bloc. “This is one of the four fundamental freedoms of the founding Treaty of Rome. It is an inviolable principle,” he said. In the interview on the publicly owned broadcaster, Mr. Juncker also mused on a number of other issues such as this year’s U.S. presidential race, and Turkish accession to the EU. The unelected European People’s Party figure told Mr. Bornstein that “Turkey is not in a position to join the EU in the short and medium term”. “If Turkey reintroduced the death penalty, negotiations would stop immediately,” he added. Mr. Juncker said he considers it illegitimate for him to “interfere in the Democratic [party] Republican [party] debate”, but the EU chief admitted he would prefer Hillary Clinton in the White House to Donald Trump. The President of the European Commission is not just committed to open borders within Europe. Under his presidency, the European Commission lists migration as one of its priorities. As well as offering residency to the world’s “refugees”, the Commission seeks to make it much easier and more desirable for Africans and their families to move to EU countries. Speaking after Islamic terror attacks left 130 dead in Paris last November, Mr. Juncker rejected calls to rethink the EU’s open doors policy on migration from Africa and the Middle East. Dismissing suggestions that open borders led to the attacks, Mr. Juncker said he believed “exactly the opposite” – that the attacks should be met with a stronger display of liberal values including open borders.